Millis Cleaning Service offers professional home and office cleaning to the greater Piedmont Triad area of North Carolina, and surrounding counties, including High Point, Winston-Salem, and Greensboro. If you need help cleaning your home or office, you know how difficult it is to get a reliable cleaning company to handle your cleaning service needs. Your home or office will sparkle from top to bottom after being cleaned by one of our trained cleaning professionals. 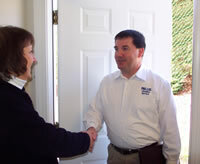 We are bonded and insured for your protection and each employee has passed a 20 year criminal background check. We realize that the reputation of Millis Cleaning Service will stand or fall on our reliability and professionalism. Call us anytime and a qualified service agent will stop by your home or office, assess your cleaning needs and provide you with a free quote. We provide a level of cleaning service that far surpasses anyone else. As a locally owned and run business, we are committed to giving each of our clients the respect and personal attention they deserve. We now offer pressure washing cleaning services, both for residential and commercial needs. We can make your home sparkle inside and out. And we can provide pressure washing services for commercial buildings, parking lots, apartment and condo communities, as well as washing fleet vehicles, trucks, utility trucks, tankers, tractor trailers, campers, moble homes and rv's.